Children enjoy the Mathnasium experience. Enjoy more math work you ask? How is this possible? The answer is simple. We make their job easier. We build their confidence. We get them and keep them on par or ahead of the rest. So we asked some of our students to share their experience. 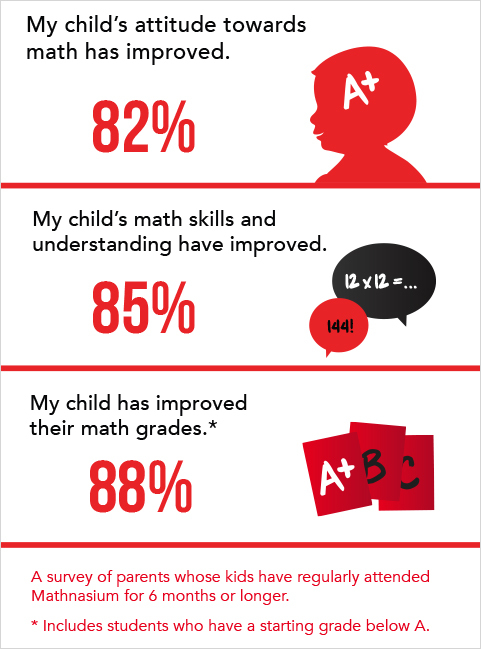 In their own words answer the question 'Why do you like coming to Mathnasium?'. "Our 8th grade daughter is an excellent student, earning straight A's in the local public school system. She really, really wanted to get into Biotech High School. While we felt that her primary education was good, and sufficiently preparing her for high school, we worried about the level of competition for the very few Biotech slots. Knowing that even one or two questions on the entrance exam might make the difference between an accept or decline result, Eliza decided that it was worth it to spend 4 hours a week with John and his staff tutoring and in the test prep course. The staff started off with a full evaluation of Eliza's math, grammar and reading comprehension skills. Then they brushed her up on troublesome concepts, reviewed areas that may have become rusty, and practiced test-taking skills. All the hard work was worth it - she got in to Biotech. We owe John and his staff a huge debt of gratitude for helping Eliza achieve her goal." "Thank you so much for helping Carmen realize her dream of becoming a member of the class of 2017 at a Monmouth County Career Academy. The money spent on your course was a tremendously worthwhile investment. “I felt really prepared going into the test. I definitely think the prep class helped me.” That’s what our daughter said when we asked her to weigh in on the class. Thank you again for helping to put our child on the best educational path available."